I know I already made a thread about Super Mario Odyssey, but that was a pre-preview preview thread. This is a regular preview thread. Keep in mind that this is NOT the review thread, though post-preview threads will be posted prior to that one. The session took us from the game's very first cutscene and starting area, a Tim Burton-esque monochrome kingdom where everything is hat-shaped and Mario can take control of frogs, to the Luncheon Kingdom, where you can become a giant slab of meat being cooked over a volcano, to a beautiful beach world where a giant octopus is stealing all the carbonated beverages for himself. 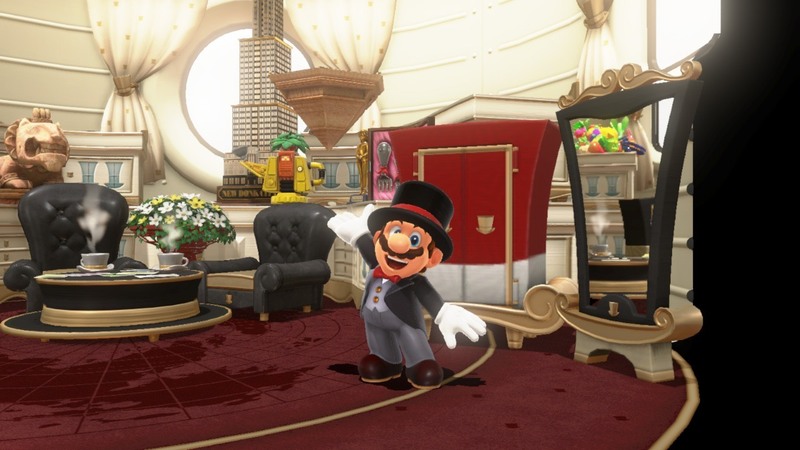 I was initially skeptical of the direction of the game, but each time I play Super Mario Odyssey, I'm more on board with the new, bizarre concepts at play. Capturing opens up so many new ideas for gameplay and world design, and the distinct areas I've explored to this point have kept me engaged even beyond the time I've had to play in them. I've left my previous demos with Odyssey wondering what secrets I missed and how else the game will surprise me when it finally comes out, and this time was no different. Mario games have always had an eye for a secret, of course - we all remember trying to break a brick block and a coin coming out - but they've rarely felt as pervasive, or as much a part of the fabric of the core game. I encountered caves with walls begging to be bounced off of and discovered hidden rooms. Simple signage can turn out to be a map to a hidden Moon. 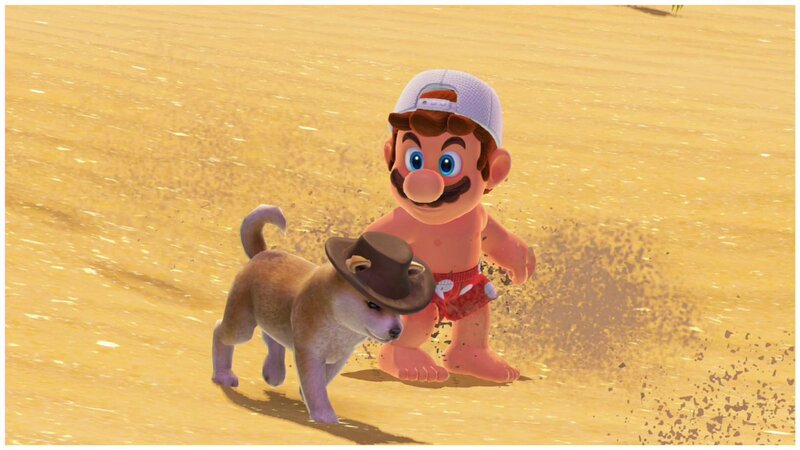 Even playing with a hat-wearing dog in the Seaside Kingdom (try playing fetch with Cappy) saw him barking to alert me to buried coins. Just as Breath of the Wild constantly dragged you off course, Odyssey's secrets are an intoxicating distraction. And while it's impossible to say whether the game will live up to the insane expectations placed upon it, all that we've seen so far has been exactly as good as you would hope and expect. As I maneuvered Mario to hop onto turtles, pass bricks and search for coins, the 3D world above still floated by gently. Occasionally, the water would cause a slight distortion in my view, or a fish would swim directly between my view and Mario. It was amazing. And, it turned out, the cluster of pipes and the 2D level, worked together to create what amounted to four distinct, tiny 2D levels that could be used to finally solve a bigger puzzle and find a purple moon. 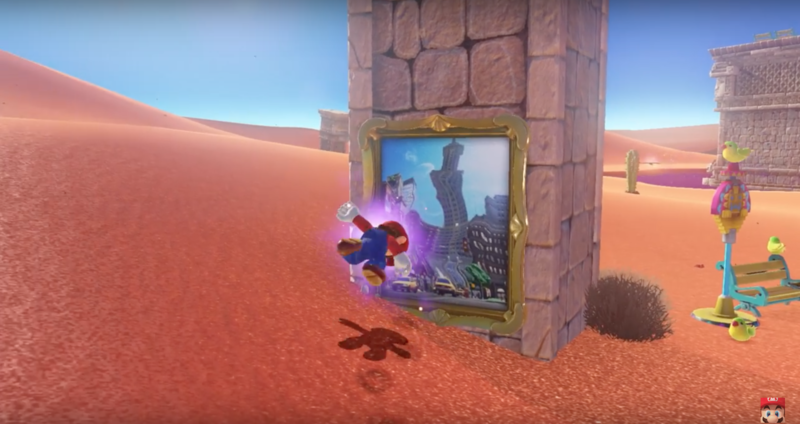 One of the first things you'll immediately want to do upon exploring a new Super Mario Odyssey kingdom was run up to every creature, person, and object and see if you could capture it. As soon as we were plunked into the Seaside Kindgom, I sprinted around flinging my cap at every single critter. This was followed by a lot of cooing at whatever weird Mario hybrid was created. Mario became an octopus that shot water out of its backside, He became one of the iconic cheep cheeps ... with facial hair. I could go on for some time here &#8211; talking about all the little things like how Mario's outfit gets dirty if he falls over in dust or sand, making the world feel all that more real; or the newly revealed Snapshot mode where you can take selfies, whack a filter on, and share them online which works an absolute treat. It is the whole package that left me impressed, though; these little things, the bigger things like the scale of things to see and do, and the feeling that there was no restriction put upon the developers' creativity. Odyssey has the potential to be pretty &#8216;Super' indeed and I for one can't wait to get my hands on the full game. Post 'em if you got 'em. And they made him a Lord of Cinder. Not for virtue, but for might. Such is a lord, I suppose. But here I ask. Do we have a sodding chance? This thread is going to be the end of me. I managed to stay Switch-free because of BotW being released on the Wii U. Absolutely loved my time with it, my third hands-on - I've probably racked up 4 hours with the game total now. Happy to field GAF questions (though we're pretty heavily embargoed on certain things), too. Zelda, Metroid AND Mario all in the same year? Is, is that a nintendog? Right now I'm not watching stuff but I know I'm going to break down and have to watch some videos. Not sure if I want to look at any of this. I've seen enough to know I need this game. I think I'm going to go on blackout with this, which I rarely do ever. Bloody hell, this looks good. Many things are jumping out at me, but the most notable thing is the Sunshine-style Cappyless platforming section that Gamexplain found in the Luncheon Kingdom. Stick that in your pure platforming pipe and smoke it! Let's be honest, this game isn't real. It's just too magical to exist. Was this all at an event after the Nintendo Direct last week? My GOd best game ever made? The videos look absolutely incredible! Looks amazing, but from now on it's blackout time for me either. One months is enough for me to forget everything I saw about Mario Osyssey so far. I hope I can get it one or two days prior to launch date. I raised this point in the previous thread, but the raw videos from Gamersyde make this look damn like a 1080p game - close to it at least - even without anti-aliasing. Seriously, this game is giving me too many feelings. I believe so, Gamecentral said they had Nintendo reps chauffeuring them through (take from that what you will) and that they were only allowed to play certain parts for a set amount of time. 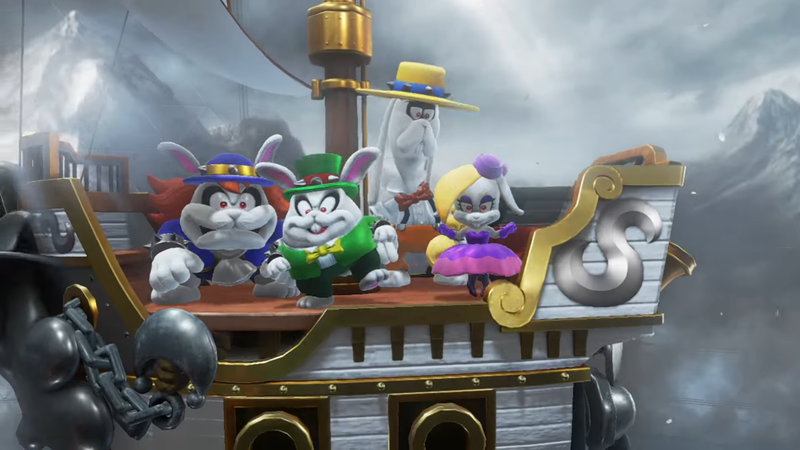 Though they did see glimpses of big secrets Nintendo want to keep hidden so this looks like the final build they were playing, though they obviously don't have review copies. It has AA in certain areas. Like I think in New Donk it has no AA but in other kingdoms like in Luncheon it has at least some sort of post-AA. Did a quick pixel count. Not comprehensive (only did one count) but looks to be 900p (well actually, I only counted the horizontal as 1600 pixel wide, which would suggest 1600x900, but I'm not entirely sure yet). I'll take 900p if that is what it looks like. Aha, thank you. Interesting if so then. The 2D section around 6:20 in the video... Holy crap. I still can't fathom this. Started watching and then turned off. Time to go into stealth mode until it comes out next month. I'M NOT WATCHING OR READING ANYTHING. Could someone just answer me if there's a confirmation of a resolution bump somewhere, please. Let's be real here, no one can at this moment. The crazy thing is that this isn't even the Switch full form. Not really a spoiler, but I'm gonna' tag it anyway. "For each demo we had a Nintendo rep hovering over us, telling us when to stop and what we absolutely could not do or talk about. For example, portraits in each stage seem to work as quick portals between kingdoms, and one of them let us get a sneak peek at one that's not yet announced. We can't say what it is but it looks amazing, and will blow the minds of Super Mario 64 fans." What's your take on the controls? Is it a game that needs to be played with motion or is using a Pro Controller good enough? "For each demo we had a Nintendo rep hovering over us, telling us when to stop and what we absolutely could not do or talk about. For example, portraits in each stage seem to work as quick portals between kingdoms, and one of them let us get a sneak peek at one thats not yet announced. We cant say what it is but it looks amazing, and will blow the minds of Super Mario 64 fans." will blow the minds of Super Mario 64 fans. A little over a month away! Hype! EZA doing a preview? This game looks incredible. Can we call it a draw for GOTY please? Oh no... Oh nononono this is going to make the wait sooooo much harder.